Today is Sunday and Sunday equals distance! 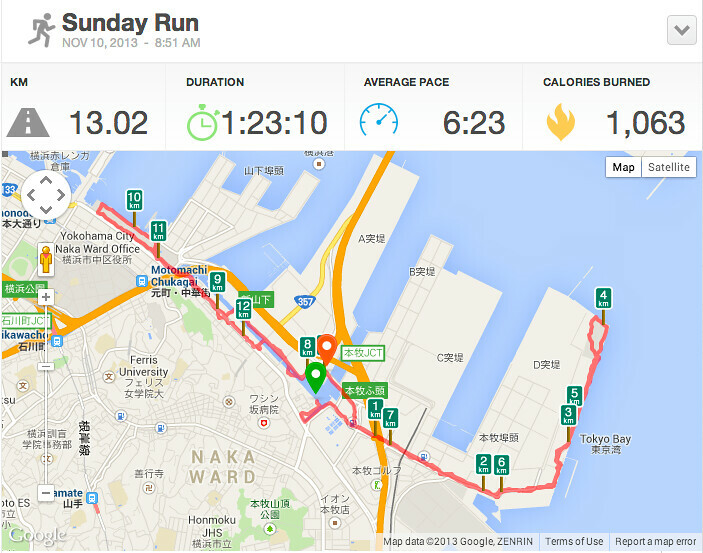 Today I ran 13 kms. This is the longest I’ve run so far this year. You can check out my stats below or click on the picture to go to my RunKeeper page. Now that the distance is increasing, my tight calves are becoming more of a hindrance, so I started doing some research into the problem. It turns out that the problem could probably be solved by wearing good shoes and stretching a lot. Not just before and after the run, but several times during the day. I came across a lot of very dodgy looking videos on how to do this. Here is a small selection. I don’t know why, but all the videos seem to be made with the same poor quality camera work and be presented by Australians who are clearly winging it script-wise. Despite this, for the last few days I’ve been stretching my calves at every opportunity in preparation for today’s run. As for the shoes, I bought a new pair yesterday. Unfortunately, although I bought the shoes in a sports store and I had successfully communicated to the salesman who didn’t speak English, that I wanted running shoes, he never put me on one of those machines that look at how your foot is when running. To his credit, he did manage to find a pair to fit my gigantic western feet and give me a ¥4000 (~AUD $40) discount. So when I ran today, my calves were much improved but my feet are now the problem. Both my feet went to sleep and my right foot felt like there was a marble pushing on the ball of my foot. When I finished the run, I removed my shoe and checked, but there was no such marble inside. And finally, my underarm chafe is just getting worse! Today I got new iPhone band chafe on one arm and t-shirt rubbing chafe on the other. It won’t be long before I will need to start bandaging my arms before running. On the upside though, apart from discomfort in my feet and arms, I didn’t feel tired really at all during the run. I never got out of breath as I kept running at a comfortable pace and although the distance is a long way short of the 21 kms I will eventually need to do, I am beginning to feel quietly confident that I may be getting a train home on race day and not an ambulance. It sounds like the problem that I had too. When we ran the other day, and I stretched after every loop, my foot did not fall asleep once. I kept doing those stretches and it really did work – all of this in my old shoes. My ankles weren’t sore either as when I ran in my new shoes. Therefore, I really think that it was all about the stretching and the proper ankle support which I did not have in my new shoes. By the way everyone, Merilyn is fast – sort of like a freak in that way. She always makes me eat her dust. Certainly the stretching helped a lot with my calves. I’m going to investigate yoga to help with that too.